On Monday nights I usually participate in a Twitter-chat called Foodiechats* which runs for about 2 hours where the moderator asks questions based on the night’s theme. This past Monday’s chat was, of course, Thanksgiving themed and one of the questions asked if you try new recipes or stick with tried and true. I feel I stick with the tried and true but after going over my to-do list for this year’s Thanksgiving Dinner I realized there’s one side dish I do experiment with; the sweet potatoes. 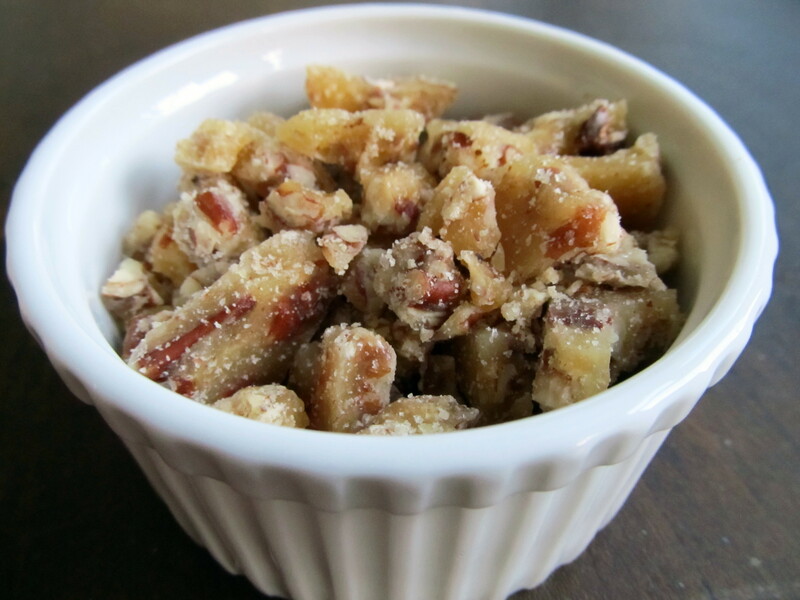 After trying out a few different ways to jazz them up over the past couple years I returned to the one I knew worked best and was the simplest: a pecan toffee crumble. Sweet potatoes are my second favorite Thanksgiving side dish after the stuffing. I’ve always like them better than regular mashed potatoes. Most people augment their Thanksgiving sweet potatoes with marshmallows, not that there’s anything wrong with that, but it’s not my favorite way. Plain old mashed sweet potatoes isn’t the most exciting either so a few years ago I began topping them with this toffee crumble which adds some extra sweetness and a crunchy texture. It’s been a hit and despite trying other new sweet potato recipes at Thanksgiving (like the failed bourbon one from last year) Cheryl always asks for it (“you’re going to go back to that crumble thing for Christmas dinner, right?”) and I suppose I should stick with something which helped me woo her. This recipe takes about 15 minutes to make and you can make it ahead of time and store in a baggie so it’s ready to be sprinkled on top right before you serve. I will warn you though, make sure you get enough pecans for two batches. Every time I make the pecan toffee I follow the timing in the recipe as I have it written down, and every time I always pull the syrup off too early and the toffee never hardens. So I end up doing it twice. (Strangely, I always purchase extra pecans because when I’m standing there in the store I remember I needed extra last year. Ok, maybe not so strange. Hmm perhaps I should change the cook time in the recipe…) I’ve fixed it in the recipe below so hopefully you won’t have to make two batches. Combine the sugar, water, corn syrup, and butter in a small saucepan and bring to simmer over medium heat. Give it an occasional stir so the butter melts and gets incorporated. Simmer for 8-10 minutes. I do not stir the mixture. I let it simmer and bubble up forming a light caramel. Make sure the foaming mixture starts to brown. After 8-10 minutes stir in the salt and baking soda. Remove pot from heat and add the pecans. Quickly spread mixture on the parchment paper and allow to cool. Break into pieces and sprinkle on top of sweet potatoes before serving. Next Post Creamed Onions, or if you want to be fancy, Blanquette d’Oignon! Hope you’re having a great Thanksgiving dinner! We had ham and are having a good time. My friend Diann says she has a suggestion for your sweet potatoes. Add rum to the sweet potatoes. If your guests don’t like rum you can ignite it and flambé the sweet potatoes, very impressive! That sounds yummy. I don’t like sweet potatoes, but my husband, my sister, her kids and my granddaughter all love them… so needless to say they remain a traditional Thanksgiving dish at our house. Several years ago I made them for the first time and I got the recipe from Aunt Ri . I have to say they are still not my favorite, but as far as sweet potatoes go- they are pretty good. If you want to give them a try let me know and I will email you the recipe…Next time I think I will try topping them off with your pecan topping instead of the marshmallows…but I suspect I will be hearing some grumbling about the missing marshmallows. Two friends also gave me 2 different cranberry sauce/relish recipes..let me know if you want to give them a try…. Hubby also likes the creamed onions – he’s the only one, but maybe I will surprise him next year with your recipe…. I would Dee! Please send!